Excellent news for my fellow Mexico researchers! FamilySearch quietly started rolling out its indexed Mexican Civil Registration collection last week. The digitized civil registration state collections have been available on FamilySearch for a long time, but not as an indexed collection. One had to browse through the unindexed (not searchable) collection. Being indexed means these collections should now be searchable, both through the Catalog search tool and through the Historical Records search tool. This partnership gave Ancestry the exclusive right to the indexed (searchable) collection for a period of time, in return for Ancestry investing the money and time necessary to index this collection. I attended a fascinating talk by FamilySearch on SLIG Night in the Family History Library during SLIG 2017, where a FamilySearch representative discussed FamilySearch’s digitization projects and priorities, and during this talk, he discussed this specific partnership with Ancestry, referencing the exclusivity agreement, which would expire in 2018. 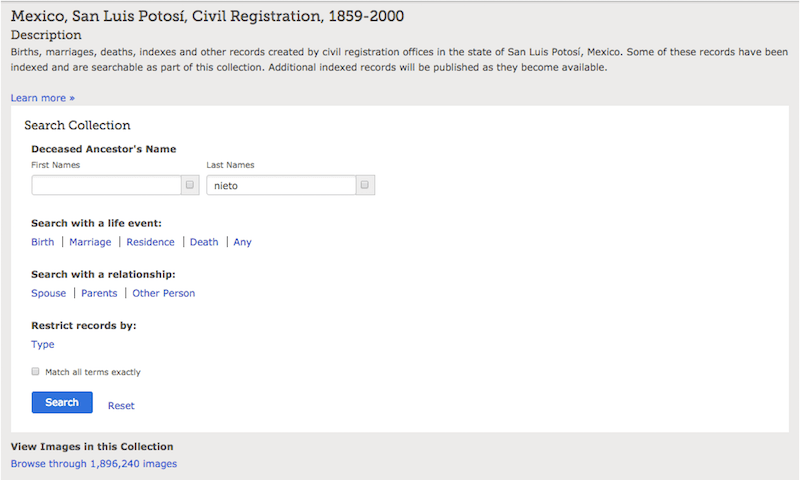 I used the link (from the table below) to access the newly indexed civil registration records for my ancestral state of San Luis Potosí yesterday, but a search for one of my main surnames (Nieto) did not bring up any results. The FamilySearch announcement describes “…over 63 million new Mexico historic records published this week” whereas Ancestry’s 2015 announcement described “More than 220 million searchable historical records…” published.4 So it looks like last week’s collection release by FamilySearch is just the first stage. Patience, right? This means we have to be patient for the entire collection to come available. These records being easier to get to without going to Ancestry would be nice for my Spanish branch, but I’ve been following this since the announcement. Turns out the announcement was a mistake. Support confirmed to me that the indexed records were added and removed. They will not likely officially fix the mistake on their website unless more people complain about the misleading press release. They do good work, but no one is perfect. As of today the indexed records are appearing actually on FamilySearch.org again. There are a few possibilities. Maybe the agreement was renegotiated with Ancestry.com to allow this earlier release or maybe this is what the agreement allowed all along. Because it was announced in early February and then the records were taken back down it seemed to me like FamilySearch may have released them early by mistake, but unless someone in the know explains what happened I guess we just will not know. Fingers crossed that they do not take them down again. Hi Michael. Thanks for reading the post and commenting. It was a FamilySearch employee I spoke with initially about the release of the indexed collection. 2018 has always been the year that I’ve heard FamilySearch officially say the embargo would be lifted. There could be a number of reasons that the indexed collection became temporarily unavailable, but I am glad to hear they are back up now.